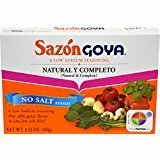 For those watching their sodium intake, Goya Sazon Natural & Complete is the same great flavor and only a fraction of the salt. Goya Sazon's special blend of seasonings makes every dish it graces taste truly exceptional. Inside this box you'll find the secret to creating the authentic flavors of Latino cuisine. Just one packet makes a world of difference.